During the period that the Watts Gallery at Compton, was closed for a major programme of restoration and refurbishment, the Society for the Arts and Crafts Movement in Surrey was also busy - planning a gift to be presented to celebrate the re-opening of the Gallery, which took place to great acclaim on 18 June 2011. 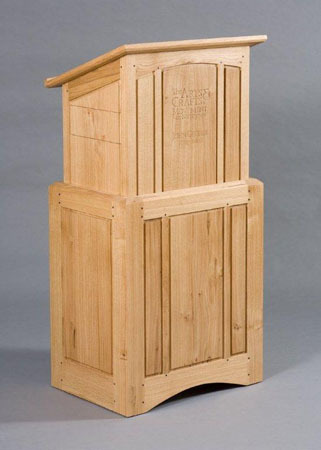 The gift takes the form of a lectern, designed in the Arts and Crafts idiom and created by Mark Ripley Furniture Designer/Maker. 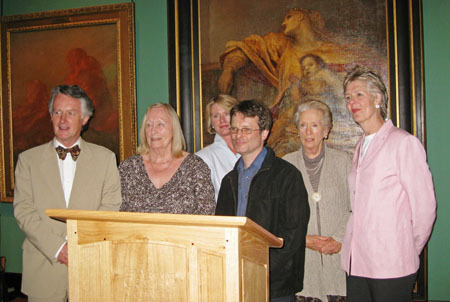 It was presented on 22 June 2011 at an evening event at the Gallery attended by seventy members of the Society and representatives of Watts Gallery. The lectern has a carved inscription as it serves as a memorial to John George, co-founder and former Chairman of the Society from 1995-2008. John was a strong supporter of Watts Gallery and the John George Study and Archive Room at the Gallery is named after him. In her introductory speech, Chairman Dr Desna Greenhow said that “the lectern represents a bringing together of John’s part in the two organisations” and represents “the relationship between the Society and the Gallery that has always been two-way and extremely friendly”. John George’s wife Ros and daughter Hilary Lady Apsley also attended the occasion and Ros in her speech described the lectern as “a fine piece of craftsmanship that John would have liked”, she added “thanks to everyone for remembering him and appreciating his founding of the Society in this way. The new room will be good for students carrying out in-depth study”. A tribute to John George was given by Professor Michael Wheeler, Visiting Professor in Literature in the School of Humanities at Southampton University, formerly Director of the Ruskin Programme at Lancaster University, where he lead the project to build the award-winning Ruskin Library. As a good friend to John, Professor Wheeler referred to the guidance he had given whilst John studied Ruskin, his architectural criticism, response to the Christian gospel and the kind of thinking that made the Arts and Crafts Movement possible. He welcomed the John George Study and Archive Room and the lectern in John’s memory and concluded “It’s my great pleasure to congratulate both the Arts and Crafts Movement in Surrey and the Watts Gallery on having had such a doughty champion as John George, with his boundless enthusiasm and genius for getting things done, and done so gracefully”. Mark Bills, Curator of Watts Gallery expressed the Gallery’s gratitude for the new lectern, saying “It is wonderfully fitting that the Society has gifted the lectern”. He felt that it encompassed John’s characteristics of generosity, elegant style and admiration of scholarship and commented that it symbolised the Arts and Crafts Movement in Surrey’s partnership with Watts Gallery. The commissioning of the lectern has been an exciting and successful project for the Society and those concerned have enjoyed working with Hampshire-based Mark Ripley as the design has evolved as a contemporary interpretation of Arts and Crafts themes. It is made of solid French oak with ebony details and a carved inscription of the Society’s logo and John George’s name. Of traditional construction with through-wedged mortice and tenons, it features a height adjustable top column with slope for lecture notes and there is a pullout computer shelf. Practical matters such as internal housing for cabling and lighting have been incorporated and lockable casters provide for manoeuvrability. Discussing the specification with interested groups around him, Mark said “It was a challenge bringing together various aspects of the brief to work harmoniously” and “it is always nice to be part of the continuation of a tradition, especially when it is for a public building”. During the evening Society members were able to see the newly restored building and the ‘John George Study and Archive Room’ and view the two opening exhibitions: a small one on the painting of ‘Hope’ blind-folded playing a broken lyre, Hope: World Icon and Painting for the Nation: G.F. Watts at The Tate. Mark Ripley trained at Leicester Polytechnic where he was inspired by the Arts and Crafts movement and the spiritual creativity of the Shakers. His pieces feature recurring themes that have evolved through over 20 years of professional work. Design and making have become integrated to create furniture with a meditative simplicity and inherent economy. Mark is a member of the Society of Designer Craftsmen and the Hampshire and Berkshire Guild of Craftsmen, he exhibits his work widely and his designs have featured in numerous books and magazines. His own book Making Furniture: Projects and Plans has recently been reprinted.